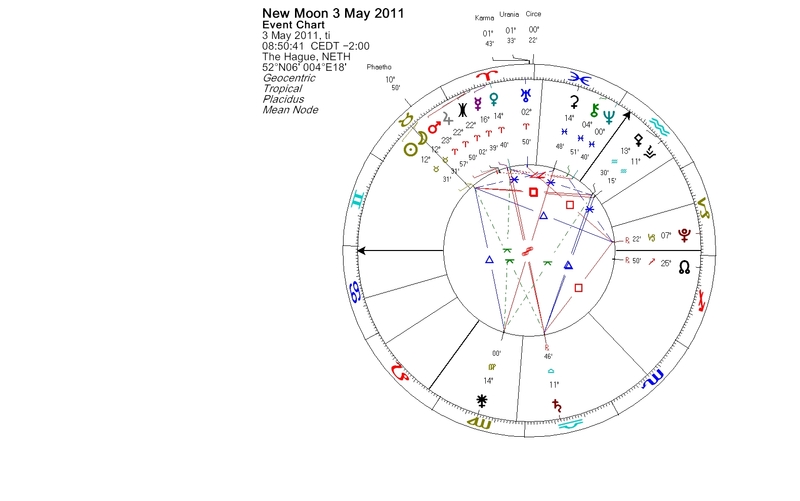 The New Moon marks the beginning of a new lunation cycle. The Taurus New Moon takes place soon after Jupiter conjoined Eris in Aries, on April 29th. It was the day of the royal wedding of Prince William and Kate Middleton. Also the scene of the most famous tale of the Greek goddess Eris was a wedding party. During the following two days Mars passed over Eris and Jupiter. Suddenly the images of the newly wed couple kissing on a balcony changed to pictures of Osama Bin Laden and people celebrating his death. Conjunct the New Moon is a strange little asteroid, Phaethon. Phaethon is showing mixed cometary and asteroidal features and its unusual orbit goes closer to the Sun than that of any other numbered asteroid. This is why it was named after the son of the Greek sun god Helios. The name Phaethon means the “shining.” Astrologically Phaethon can bring a feeling of being a bit out of control. At the Aries Point, the sensitive point where public and personal affairs intersect, we find asteroid Karma. We may feel that as individuals we don’t usually have much influence on the affairs of the world. With our personal choices we create our personal karma though. At the Aries Point we can make an impact on the world. In conjunction with Karma are two helpful asteroids, Urania and Circe. Urania is the heavenly muse of astrologers and astronomers. Urania gives ability to put things in perspective. Asteroid Circe is named after a minor goddess of magic, the daughter of Helios. Circe has a desire to help. “Its position indicates who, how and, most importantly, WHY you aid others,�? writes Martha Lang-Wescott. The three asteroids at the Aries Point make a novile aspect (40 degrees) to the Luminaries and Phaethon. The novile is a minor aspect with a similar quality to the trine, though more subtle. It could act as a harmonic link between subtle spiritual dimensions and the ordinary realms of human activity. You are currently browsing the Lunations by Kirsti Melto weblog archives for May, 2011.